MY INTRODUCTION TO BOATING BEGAN 50 YEARS AGO ON A BOAT THAT contained just two of us and little equipment. One day when I couldn&apos;t find one of the few tools we had aboard, my mate sat me down, looked into my eyes and solemnly said, "A place for everything, and everything in its place." Having my full attention, he began his story. "In 1850, during the Gold Rush, a ship in San Francisco Bay was drifting in the current toward another ship. The captain realized the danger and yelled, &apos;Prepare to drop anchor.&apos; The crewman searched for the sledgehammer normally used to release the pelican hook holding the anchor in place. A ring locked the pelican hook closed. "The ship drifted faster in the changing tide, and the captain screamed at the sailor, &apos;Where&apos;s the sledgehammer?&apos; The sailor shook his head in fright and dismay. The captain then shoved him aside and searched for the hammer himself, but he couldn&apos;t find it either. "In frustration he tried to kick the pelican hook loose with his foot. 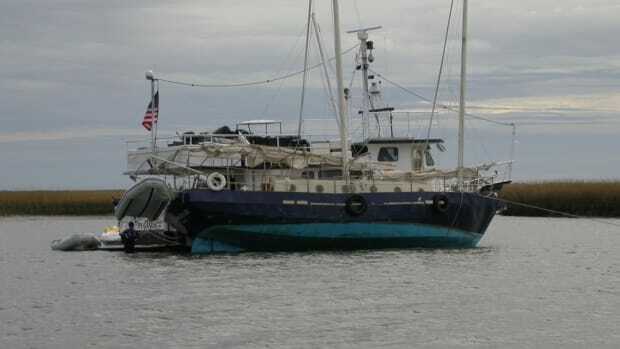 As a result, he broke his foot about the same time his ship crashed into the other vessel. The crew heard the captain howl in pain, &apos;A place for everything, and everything in its place!&apos;"
I am sure there were expletives to follow, but Bob left those out in his story. Suffice it to say, that bit of advice was permanently burned into my brain and has continued to be an important factor in each boat we have owned. I am happy to report there has never been a broken foot aboard our boat, although we did lose a small plastic Christmas tree after a yearlong cruise, not finding it until we replaced our head several years later and found the tree tucked away behind it. We fit the example that nobody&apos;s perfect keeping track of everything. When we bought our 46-foot Cheoy Lee trawler, Sea Chantey, the captain&apos;s words took on a critical new meaning. Not only did we have to know where everything was placed, but also how to keep things in place//especially in heavy seas, whether it was a 14-foot ocean swell or a titanic wake caused by a thoughtless boater who passed right next to us. Our solution to stopping the roll was adding stabilizers. The cost made our pocketbook suffer, but the stabilizers made cruising a joy. The stabilizers only stop rolling, not the "hobbyhorsing" of wave action. But we still felt they were worth their weight in gold, and we sang their praises as we cruised up and down the Atlantic coast, did the Baja Bash in Mexico, ploughed up the coast of California, Oregon, Washington and Canada, then returned home to San Francisco. To deal with the serious consequences of hobbyhorsing, we found the following solutions to the problems we encountered. Problem: How to keep the food from flying out of the refrigerator shelves when we opened the door, covering the galley sole with an unholy mess of food. Problem: After replacing our 21-year-old autopilot, radar and VHF, as well as adding a new GPS and laptop computer, we needed the equipment technical books to be in reach without overloading our small chart table. 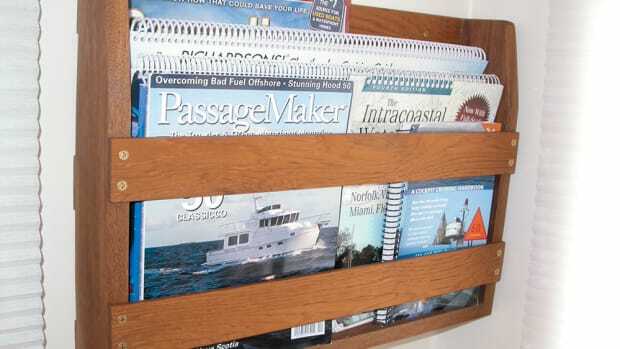 There wasn&apos;t sufficient room in the pilothouse for extra bookcases. We also wanted a place where we could eat, read or keep the log while under way-without the balancing act of doing all this in our laps. Solution: Bob carefully removed the footrest in the pilothouse below the bench seat, cutting it into three sections. He then attached piano hinges to the sections, along with teak on the front and open side, essentially boxing the footrest into three complete compartments. They easily hold all the manuals, plus textbooks relating to ham radio, and chart books and guides. As for balancing our meals and keeping the log, Bob made a small table that accommodates two people seated on one section of the pilothouse bench seat. This leaves some settee area open to get to the helm wheel quickly when needed. Problem: How does one store the myriad stainless steel screws (of different sizes), fuses, washers and wire terminals that define a well-equipped boat, yet allow easy access to them when needed? Solution: Bob built a special rack filled with small tackle boxes, all labeled and placed at an angle. We&apos;d used this unit in our sailboat when we cruised the South Pacific and needed to be self-sufficient. Never did any of the boxes jump out and spill. So before we sold the sailboat, we took the racks off and installed them aboard Sea Chantey. They are located just outside the engine room door and the entrance to our cabin. Problem: How could we keep the trash container from falling over and spilling the contents? Solution: Our galley cupboards were never built with a space for trash in mind. We solved this problem by buying a stainless steel garbage can, compliments of Costco, and placing it by the breakfast bar near the galley. We made and installed a small clip next to the can on the sidewall. The top of the trash can comes down over the clip and is held securely. Bob made the clip by bending a piece of flat stainless steel in a vice to fit under the trash can lid. Solution: Bob permanently attached a piece of heavy Velcro hook strip under the arms of the chair, and another permanent hook strip under the edge of the Corian countertop. Both of these strips are hidden from view. He then cut four separate strips of eye-hook Velcro, long enough to reach from under the chair arm to below the countertop. While under way, we place the chairs up against the counter and attach the Velcro eye strips between the chairs and the counter, which hold the chairs in place. When we reach port, we remove the eye strips and keep them handy in a drawer, ready for the next bumpy ride. Problem: How can we store tools for easy access in the engine room, and how can we install large cases that contain heavy loads and guarantee that they will stay put? The true test came during a full gale off the California coast in May 2001. 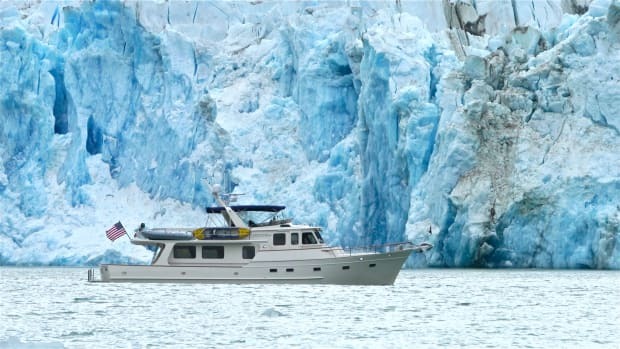 Solution: We were blessed with a walk-in engine room, which most boats in our size range do not have. This was the primary reason we bought our boat. At our age, climbing up and down a ladder is courting disaster, especially when trying to lug 24 quarts of new oil down into the engine room, then bringing up 24 quarts of old oil for recycling. We needed a stairway. Bob built in storage for tool cases, all labeled, then installed a removable wooden rail in the front opening that locks in place. Unlocked, he can pull the toolboxes out. He also uses space cases to hold extra engine oil, transmission fluid and filters. To keep those secure, he built a hinged wooden edge that is locked up when not in use. The upper shelf is just below the top of the space case, so with the edge locked up, the space case and contents cannot escape. To remove the space case, we just pull the lock back and slide it out. Problem: When we installed our inverter, we wanted to make sure we would never flip the wrong switch while trying to turn it on. A slip of the finger could turn on the 110VAC generator, which will "fry" the inverter if both are on simultaneously. This happened to friends of ours while cruising. Solution: Bob made and installed a pendulum-like lever above the two circuit breaker switches with positive stops on each side. The size and shape of the lever is such that either switch can be turned on easily, but it is impossible to have both switches on at the same time. All of the above changes have made Sea Chantey a more comfortable and safer boat, as well as more livable. The captain of that old sailing ship would approve because we have a place for everything, and everything in its place.